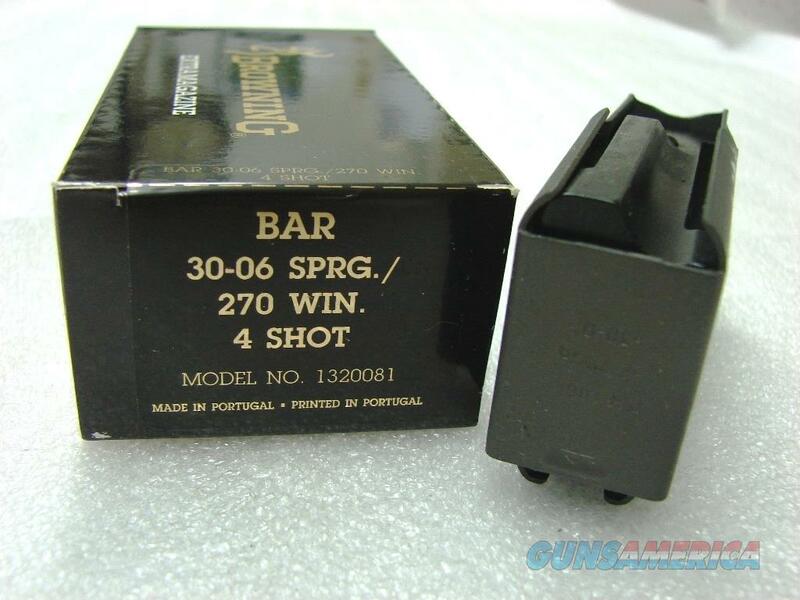 Browning BAR Factory 4 Shot Magazines for .270 .280 .30-06 calibers Old Model Pre 1994 B.A.R. No Mk II Browning Automatic Rifle Pre-Mark II Long Action 270 280 3006 1320081 Buy 3 Ships Free! Description: NO MAGAZINE SALES into NEW YORK CITY. CONNECTICUT residents must furnish us a copy of your CT State permit. This listing is for ONE Magazine. Buy 3 Ships Free: Combine any 3 of our non gun non ammo listing lots, and the entire order ships Free! The old model Browning B.A.R. Semi-auto Sporting rifles were such good guns that there are literally tens of thousands of them still in service, and there will be during most of our shoppers’ lifetimes. In 1994, Browning changed production to the Mark II series with a bolt release lever. If your rifle is an old model Browning Semi Automatic with no lever on its side, chambered in .270 Winchester, or .280 Remington / 7mm Express, or .30-06 Springfield caliber, here is your replacement magazine. Browning serialization and years of production is readily available at proofhouse com, and the old model BAR was manufactured 1967 – 1993. Magazine manufacturer was Mec-Gar s.r.l. of Brescia, Italy. Importer, warrantor, and exclusive distributor was Browning Arms of Arnold, MO. Construction is entirely steel metal, with black polymer cartridge follower. Each magazine holds 4 rounds of .270 Winchester, or .280 Remington / 7mm Express, or .30-06 Springfield caliber ammunition. Browning never made an old model BAR in .25-06 caliber, but if anyone rebarreled one of the old rifles for that caliber, these would work. These magazines will NOT work in any other caliber Browning. Each comes in its original factory packaging, as the photos show. Production of these magazines were discontinued over 10 years ago. Replacement pricing, if a person can even find one, is upwards of $75.00. We’re offering the last ones, however, each	for only	$ 54.00. Buy 3 Ships Free! Not for sale to residents of New York City. Any magazine deliveries into New York City require written permission from the Police Commissioner, so we cannot ship magazines into any of the six boroughs or 176 some odd zip codes, per NYC Code 10-131.10. Connecticut buyers must furnish us a copy of your State Issued Eligibility Permit or Ammunition Certificate, per P.A. 13-220. Any ammunition, firearms, or personnel showing in any of our photos are NOT included.